Gold is on the rise. It recently surpassed $630 per ounce, an increase of more than 145% from its low of $254. As of mid-2005, it has increased approximately 30% in all currencies, and is no longer simply reflecting US-dollar weakness. Media coverage attributes these increases to supply shortfalls, geopolitical concerns, rising oil prices, inflation fears and US financial imbalances. The reports typically focus on trading implications, since most investors and analysts think of gold as a short-term speculative trade in an industrial commodity. Platinum and silver have both outperformed gold since 2000, but they have received little attention. There is, however, an important reason why investors should pay attention to precious metals: strategic asset allocation. Strategic asset allocation ensures a fully diversified investment portfolio by properly balancing asset classes of different correlations in order to maximize returns and minimize risk. While many investors believe their portfolios are diversified, they typically contain only three asset classes – stocks, bonds and cash. Real estate, commodities, precious metals and collectibles rarely form part of most investors’ portfolios. Containing only three asset classes out of seven, such portfolios are clearly not adequately diversified. Precious metals provide effective diversification and improve returns, while at the same time reducing volatility during both bear and bull markets. The old Wall Street saying, “Put 10% of your money into gold and hope it doesn’t work,” still holds true today. The validity of this old adage was recently confirmed in a June 2005 study carried out by Ibbotson Associates. Bullion Management Services Inc. commissioned the study, entitled “Portfolio Diversification with Gold, Silver and Platinum.” Rather than examine the fundamental reasons behind the current bull market in commodities, it addresses the fact that relatively little research has been done on the role of precious metals in strategic asset allocation. Particular attention was spent on the correlations of precious metals with traditional asset classes, and how this relates to diversification. Importantly, the Ibbotson study did not take into account the various drivers currently contributing to rising prices. Instead, it used current (low) CPI statistics, and projected a continuance of similar performance for equity and bond markets. Low correlations between asset classes are the basis for diversification. Many investors believe their portfolios are diversified if they contain a mix of stocks, bonds and cash. Unfortunately, correlations between traditional asset classes have been on the rise resulting in portfolios that are not adequately diversified. From 1926 to 1969, the correlation between annual total returns for US stocks and bonds was an attractive -0.02. Recently, US stock and bond market correlations have increased. This tendency is reflected in the 10-year rolling correlations from 1970 through 2004 that ranged from -0.03 to 0.80. The uncertain diversification benefit, in combination with attractive returns observed in other asset classes, drives the vigor with which opportunities in non-traditional (or alternative) asset classes have been pursued in recent years. The primary method for improving the risk-return characteristics of the efficient frontier is to expand the opportunity set of available asset classes. Ibbotson’s study examined a 33-year time period from February 1971 to December 2004. While there is data available for gold and silver that predates 1970, it is less pertinent because the US dollar was still convertible to gold at that time, and the price of gold was fixed. After US President Richard Nixon closed the gold window on August 15, 1971, the price of gold was allowed to float. Although there is some debate on what constitutes an asset class, it is generally agreed that there are capital assets such as stocks, bonds and real estate, consumable assets such as commodities and store-of-value assets such as currency and fine art. The fact that precious metals are both consumable assets and store-of-value assets is not well understood by the investment community. While the three constituents are all precious metals, gold and silver have a long history as monetary assets and are often viewed as a safe harbor during times of crisis or high inflation. Conversely, during an economic expansion, the commodity demand for silver and platinum is thought to increase. Since an investment in mining stocks does not provide a direct exposure to precious metals, the study focuses on a direct, physical investment in an equally weighted portfolio or composite of gold, silver and platinum bullion. Ibbotson constructed an equally weighted composite index using gold, silver and platinum bullion, and referred to it as the Spot Precious Metals Index (SPMI). Ibbotson used this Index as a proxy for the precious metals asset class. 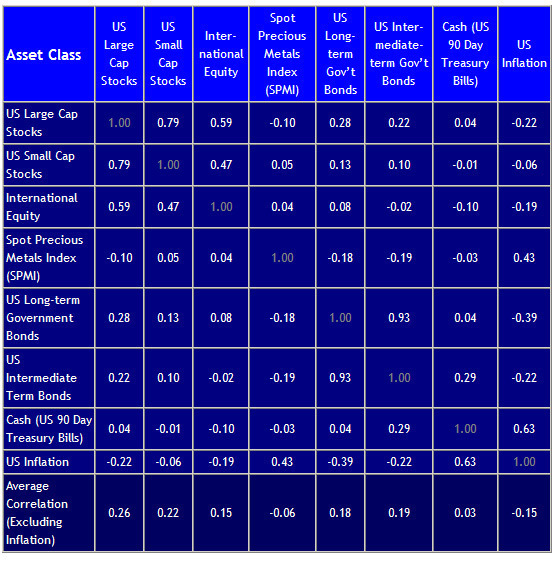 Over the entire 33-year period, the three equity asset classes outperformed the other asset classes. The overall performance of the SPMI was closer to that of the fixed income asset classes. The SPMI outperformed both cash and inflation. For over 11 years (May 1973 to August 1984) the SPMI was the top-performing asset class, with the longest run of any of the asset classes. During the low inflation period, the SPMI had the lowest compounded annual return. During the high inflation period, the compounded annual inflation rate was 8.62%, and the SPMI had the highest compounded annual return of 20.83%. For the period studied, precious metals provided a substantial hedge against inflation. While the standard deviation of the SPMI is quite high in isolation, according to modern portfolio theory it is the interaction of asset classes with each other that provides diversification. Of the 33 years of annual data, there were nine years during which US large-cap stocks had negative returns. During these nine years, the SPMI had the highest average arithmetic return. Of the 33 years of annual data studied, there were six years that the equally weighted portfolio of traditional asset classes had negative returns. The average arithmetic return of the portfolio of equally weighted traditional asset classes for these six years was negative 3.5%. For the same six years, the average arithmetic return of the SPMI was a positive 13.4%. Precious metals provided positive returns when they were needed most. 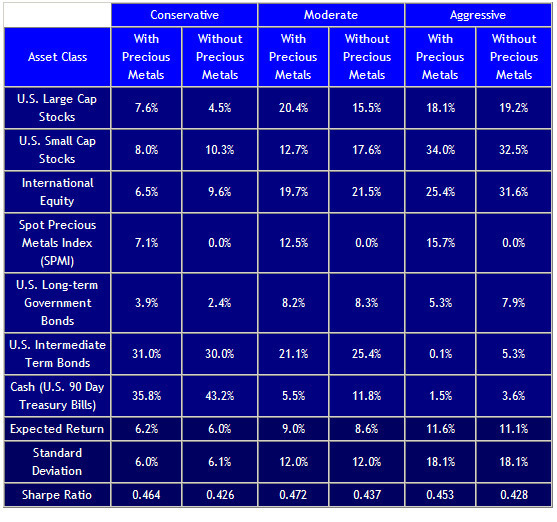 Of the seven asset classes, precious metals is the only one with a negative average correlation to the other asset classes. It is also worth noting that, excluding cash, precious metals is the only asset class with a positive correlation coefficient with inflation, which is further evidence that precious metals act as a hedge against inflation. The historical efficient frontier with precious metals is superior to the historical efficient frontier without precious metals. With the exclusion of the maximum return asset allocation, including precious metals in the opportunity set improved the risk-return tradeoff over the entire historical efficient frontier. Importantly, the allocation to precious metals does not come at the expense of any single asset class, but rather it comes from a reduction in several asset classes. This suggests that the unique risk/reward profile of precious metals makes them a useful diversification tool in strategic asset allocation. Based on the historical efficient frontiers, Ibbotson found that including precious metals moderately improved the efficient frontier. Allocations ranged from approximately 0% to 9%. Based on the forward-looking resampled efficient frontiers, asset allocations that include precious metals have better risk-adjusted performance (as measured by Sharpe ratio) than asset allocations without precious metals. Investors can potentially improve the reward/reward ratio in conservative, moderate, and aggressive asset allocations by including precious metals with allocations of 7.1%, 12.5%, and 15.7%, respectively. These results suggest that including precious metals in an asset allocation may increase expected returns and reduce portfolio risk. While there are many paper proxies for precious metals that can provide trading opportunities during a bull market, the hedging benefits and protection against Fat-Tail events such as a currency crises or derivatives accident may only be available if actual bullion is held. Many precious metals investments are simply counter-party liabilities and not an actual investment in bullion. In the event of a counter-party default, the benefits of bullion may not be realized at exactly the time when they are needed most. From a strategic asset allocation point of view, therefore, it is critical that fully allocated, segregated and insured gold, silver and platinum bullion is held. For a full copy of the Ibbotson report contact Bullion Management Services Inc..